There are few things more satisfying than to make your own pasta. It is delicious, inexpensive, healthy (no additives) and looks like you went to a hell of a lot of trouble for your guests. (but it is easy). I’ve been making my own pasta and teaching others for close to 40 years. 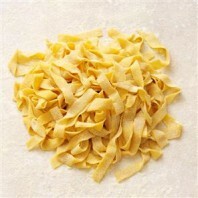 The following video by Jamie Oliver is a good example of how easy and fast it is to make your own pasta. You can even dry and freeze your fresh pasta for even quicker meals later. The recipe I’m about to give you is different than Jamie’s but I’ve had good results over the years with it. This is enough for 2 normal servings. For a dinner of two couples I would make at least 3 of these. If you have leftovers, freeze them or refrigerate and use them tomorrow. 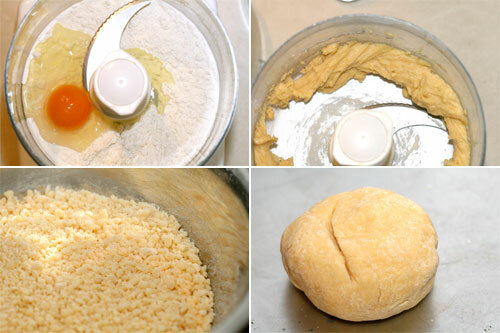 Just as in Jamie’s video, I’d mix the dough in a food processor. Put all of the ingredients in the processor except the water. Turn on the processor and as it turns into a grainy texture, drizzle, very slowly, water in through the feed port. Stop adding water just as the dough starts to ball up. Continue to process for another 10 seconds until the dough sticks to the blade in a ball and spins around the processor. Remove and rest the pasta ball under a clean towel for 5 minutes, or while you make the other servings you require. 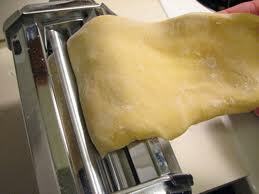 To continue by hand, knead the dough for 5 minutes or until it is elastic without cellulite like bumps in it. Dust the rolling surface with flour and roll out your pasta into long thin sheets about a 1/16 of an inch thick. Then dust the sheets again with flour and roll the sheets into loose rolls to slice with a knife to the thickness of pasta desired. Knead the pasta on the thickess setting until it is smooth. Then lower the setting one pass at a time until you reach the desired thickness. 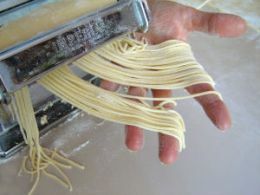 Then turn the handle around to the cutting side and cut into noodles. Cooking fresh pasta couldn’t be easier or quicker. Bring a large pot of water and 3 T of salt to a boil. When you reach a rolling boil add your fresh pasta. You’ll need to have your colander ready in the sink because the cooking should only take 45 to 90 seconds. After the noodles are done transfer them into the colander and briefly run cold water on them to stop the cooking. After draining the pasta, place the colander, pasta and all on top of or in the still warm (but not on) pot. Stir in a little butter or olive oil. Season and serve.